Zinc Spray. Excellent cathodic corrosion protection on ferrous metals. Restores protection to galvanised parts. Colour: Grey. Service temperature range (°C): -50 - to +550. 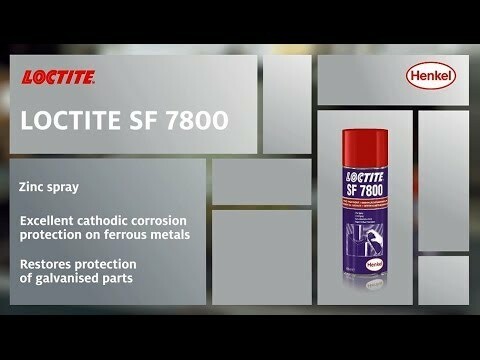 LOCTITE® SF 7800™ provides a corrosion protective coating at room temperature on ferrous metals. Typical applications include touching up metal parts after welding and to provide long-term protection of metal assemblies. It is also used to restore protection to repaired galvanized parts (e.g. crash barriers, tubes, flanges, tanks, panels, etc.). This product is typically used in applications with an operating range of -50 °C to +550 °C.